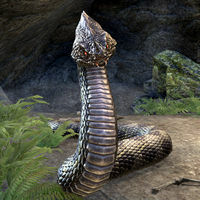 The Nestmother is a giant snake found in her den in Auridon. The Nestmother has a chance to drop Elegant Serpent's Flame, an item in the Queen's Elegance item set. This page was last modified on 19 November 2018, at 04:29.